Dr. Lance Plyler, disaster assistance relief team leader, addresses the crowd at the handover ceremony. 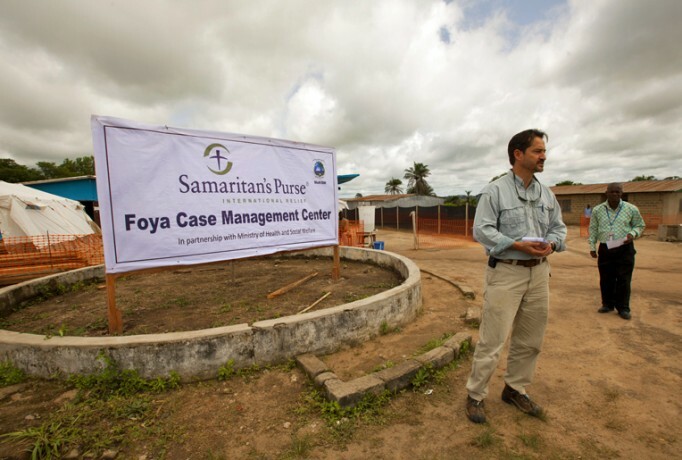 Samaritan's Purse has assumed management of the Foya Case Management Center. Samaritan’s Purse is working with other organizations to treat patients and stop the spread of Ebola. Azaria Marthyman is a doctor who is working with Samaritan’s Purse to help treat Ebola patients in Liberia. After flying across North America, then across the Atlantic Ocean, I finally arrived in Monrovia, Liberia, on July 4. The trip seemed to take forever, with a delayed connecting trans-Atlantic flight due to Hurricane Arthur. More than 20 hours later, I was glad to land in Monrovia after one of the bumpiest commercial airplane rides I have had. Here in Liberia, Samaritan’s Purse is collaborating with Serving in Mission, ELWA Hospital, and the Liberian Ministry of Health to fight the deadly Ebola virus. I have been learning the approach to community awareness and education, which is critical in preventing a wider spread of what is already a frightening outbreak in the West African region. 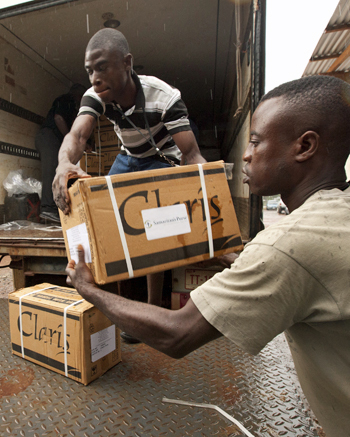 BATTLING AN EBOLA OUTBREAK: Samaritan’s Purse is providing direct care to patients suffering from the deadly disease. Shipments of much-needed supplies have arrived in Liberia, including this one that contained personal protective equipment. Shortly after my arrival, I headed to the clinic to treat patients. Putting on and being in the personal protective equipment for the first time was quite an experience. It felt restrictive being in the full body suit, with full head and face protection, double gloves, and googles. No area of my skin was exposed. I can only compare the experience to that of being in my flight gear when I flew in the Canadian fighter jets many years ago while serving in the Canadian Military. Breathing in the protective equipment felt difficult, but after some time, I acclimatized as I focused on the clinical care aspects. This evening, Dr. Eisenhut, a surgeon with Serving in Mission, and I admitted a 12-year-old boy that has classical signs and symptoms of Ebola. His foster mother died recently from Ebola. This is my first Ebola patient here. He has been sick only five days, and with the severity and stage of his illness, Dr. Eisenhut and I fear that he will not make it through the night. Despite our medical efforts, his prognosis is grim for survival. I pray and hope for a miracle. I thank God for the staff members at home who are supporting me through logistics and other ways. I realize that all we’re doing cannot be done without the prayers and financial support of people from all over the world. The family of God has responded and continues to care during this crisis, and that’s awesome!